Animar has an unbridled potential for growth as time elapses -- not only over individual games, but as increasingly powerful creatures are added to the card pool its strength as a deck burgeons in tandem. This project represents an attempt at catalyzing and documenting a stage in Animar's evolution. Such mutations never take place in isolation from the past: a shifting environment demands adaptation. A combination of new tools, reconstructed philosophy, and some long-forgotten lines will hopefully prove to enable Animar to flourish in an unforgiving ecosystem. From a tiny sprout, the greatest trees grow and flourish. The idea this exposition intends to germinate is the centralization of one-card creature win conditions: Spellseeker (2UGG, 2 counters) and Imperial Recruiter (RUUU, 2 counters). Refocusing toward these lines informs which engines best facilitate them, enabling a streamlining from non-deterministic Glimpse [cast a creature: draw a card] storming into direct tutor-chains. Previously, Animar has relied on variety of support to assemble Ancestral Statue + Walking Ballista ; this coincided with a deck construction philosophy that would enable Ancestral Statue to act as the nearly-one-card wincon with a complimentary high density of outlets for it. Heavy investment in Glimpse engines ( Soul of the Harvest , Primordial Sage ) and narrow artifact tutors for Ballista ( Trinket Mage , Fabricate ) let the previous builds focus on finding Statue as a Plan A, and utilizing Imperial Recruiter lines as a Plan B.
Ancestral Statue remains a central combo piece: it makes Animar arbitrarily large, reduces the colorless costs of creatures to zero, draws your library with Glimpse of Nature or Beast Whisperer , and enables an infinitely large Walking Ballista . There are several one-card paths to assembling Ancestral Statue combo, and it can be assembled with raw draw and tutor power as well. Survival of the Fittest very cleanly assembles this combo: find Ancestral Statue, use it to grow Animar, then pitch the Statue to find Walking Ballista. The release of Spellseeker improves this paradigm significantly by enabling any creature tutor to find Spellseeker, which finds Weird Harvest, which in turn assembles both Statue and Ballista as well as protection for combo execution or ways to reach critical counter mass (4) on Animar. Reaching back to older discarded lines, the Kiri-Onna Recruiter line (Recruiter > Metamorph > Kiri > Drake) (RUUU) line has been improved; previously it was thought that the line required a similar amount of blue lands to Hoverguard, but weaving in Wood Elves allows the combo to be performed on 3 blue lands (and sometimes even 2 blue, 1 non-blue land with a lift of an extra UU). Given the restructuring of the lines, the deck's support structure has gone through a corresponding paradigm shift. It now eschews a lot of the heavy non-deterministic top end, such as the Eldrazi and 6-mana Glimpse creatures, the tiny "bounce your ETBs" creatures, and the artifact support. The demands of a faster and more stack-based interactive meta prompts us to add more interaction; we continue to be primarily focused on our own plans. We find respite from countermagic and removal with counter-building creature protection like Prowling Serpopard , Gaea's Herald , Spellskite , and Siren Stormtamer . Coupled with some strong replacement midrange engines and tech from recent sets, a restructured Animar appears much more well-positioned in the contemporary metagame. With respect to the plethora of exeptions, we have a relatively static plan going into a given game. Animar goldfishes a very consistent turn 4, pushing into turn 3 occasionally. The angle we're exploiting is that in addition to being consistently speedy, Animar also plays a strong value game into stax and control; we're relatively hard to interact with on a spot-removal/counterspell level once we get cards like Prowling Serpopard and Spellskite online, and we leave our opponents very little recourse to interact with us outside of boardwipes (which we run a counterspell suite to shore up). We're banking on other decks soaking up interaction in our stead while we play for value in the early- (and optionally mid-) game. It won't always be the case that the coast is clear when you've assembled the pieces to execute your combo. In these cases, or when we aren't quite there, we have card advantage engines to keep us fueled and advancing -- Consecrated Sphinx , Slithermuse , Runic Armasaur , Sylvan Library , and Tishana, Voice of Thunder offer ways to draw cards, potentially draw out interaction, and keep stocked while we bide our time. In long stax games, we can ramp/sculpt while aiming a huge combat threat to pressure opponents; moving toward a cheap Bane of Progress followed by a combo can blow the game open when it's time. In some games where you're expecting wipes or consistent interaction on Animar, it may be prudent to hold off on playing Animar out until just before you're ready to execute a game-winning sequence. It does take a relatively self-sufficient hand to be able to profitably play this way (look for mana, draw engines like Sylvan Library , Animar-independent mana, etc.). Sculpt toward chainable creatures ( Bond Beetle , Cloud of Faeries , etc.) and a way to execute a combo. Walking Ballista serves as our primary wincon. If it becomes inaccessible, the backup combo is to assemble infinite creature casts (via Statue or Kiri loops) into Beast Whisperer , drawing the deck to assemble a Kiri loop that gives infinite ETB effects, enabling infinite recursion of any spells. This lets us destroy all artifacts and enchantments with Bane of Progress , fight all opposing creatures with Ancient Animus , create infinite swans with Swan Song , kill someone with Animar, sculpt to a hand full of countermagic, and play out our entire deck and pass into a combat win the next turn. For mulligans, you're primarly looking for the mana to cast Animar on turn 2, and a path to a win condition. This could be any creature tutor, any large source of draw, a tutor for Weird Harvest , etc. Anything beyond that is gravy, but interaction and ways to build counters are ideal. AstralCodex did some excellent mulligan simulation analysis and found these approximate values over 10,000 hands. This means there's a 93%+ chance you're able to cast Animar on turn 2 and still have a gas card, and demonstrates the consistency of the deck with appropriate mulligans. Distorted groves bear strange fruit. The namesake line is a powerful one-card wincon with Animar, fetchable through Spellseeker . Resolved with sufficient mana, Weird Harvest alone provides all of the tools necessary to execute Ancestral Statue + Walking Ballista, protect it from countermagic and removal, remove hindering stax, and provide the critical counters to accelerate Animar to the 4 counters he needs to eliminate Statue's casting cost. The basic line for X = 2 costs a total of 2GG with Animar at 3 counters. Simply fetch Ancestral Statue and Walking Ballista , play Ballista for X = 1 for a counter, cast Statue infinitely for infinite counters, using the final bounce to pick up and replay an infinitely sized Ballista. From there, expanding the lines to include protection or acceleration is a matter of understanding the relevant pieces that can be incorporated into the line. Prowling Serpopard makes all creature casts uncounterable. Gaea's Herald provides backup for this. Spellskite can build a third counter for free and offer protection from removal on Statue. Sylvan Safekeeper can give us protection from spot removals equal to the number of lands on board. Siren Stormtamer can provide one-time protection for a (heavy) lift of UU. Spellseeker can tutor counters or Crop Rotation for Gaea's Cradle for protection mana. If you already used Spellseeker (perhaps to find Weird Harvest), Phyrexian Metamorph can copy it for no extra mana at 3 counters. Several creatures can be used for stacking counters mana-efficiently. Bond Beetle is best at 0 counters. Cloud of Faeries shines at 1 counter and refunds mana for countermagic as well as produce protection mana (especially good with Cradle/Serpopard). Spellskite is a free pick at 2 counters. Gilded Drake can be used to steal asymmetrical creature stax like Linvala. Bane of Progress can clear the way of things like Null Rod or Trinisphere. Eternal Witness can recur missing pieces. The elephant in the room is the fact we're giving our opponents creature tutors to use as they please, and this comes with inherent risk. Importantly, only attempt Weird Harvest when the subsequent combo attempt is in the immediate clear. The game is likely lost before the turn returns if the turn is passed after a failed Harvest. Realistically, the main things we need to be vigilant of are things our opponents can get to interact with us at instant speed. However, there aren't many to be concerned about, and each of them have either in-deck options or, if you see them regularly, can be teched against. The primary one is the possibility of a Protean Hulk that can be used with a Flash already in hand. This scenario is unlikely, but when playing against Hulk decks, you need to be cognizant of where their pieces are (mostly by gauging how much and what kinds of tutoring they've executed). Vendilion Clique can be cute meta tech against this; find it with Harvest and flash it in response to the Flash, stripping their Protean Hulk while Flash is on the stack. Hushwing Gryff is another one that might give us trouble. It's a very rare stax piece, as it misses most competitive decks, but if you happen to be struggling with it the best counter-tech option is likely Goblin Cratermaker . Snapcaster Mage is another that might allow our opponent to interact with us, but Prowling Serpopard and Spellskite can offer decent protection against it. If you're having trouble with Snapcaster recurring removal to point at Animar in response to Spellskite, Plaxmanta might be the tech-in. Spell Queller interestingly dodges Serpopard and our removal protection. The best method to deal with this being pulled in is likely Spellseeker into Pact of Negation . Aven Mindcensor largely doesn't cause us issues after Harvest resolution, but can if we're leaning on additional Spellseeker triggers; keep this in mind. Venser, Shaper Savant is very rare in cEDH, but might present a threat. The best solution is likey Plaxmanta . Mystic Snake in a similar vein is beaten by Serpopard. Kiri-Onna is an opaque but powerful enabler of Imperial Recruiter lines. With a single Recruiter and a few blue-producing lands, we can produce infinite counters, mana, and find Walking Ballista. Previously, it was thought that this line was gated heavily by the number of blue-producing lands you have in play, but reworked lines enable weaving in Wood Elves to fetch additional blue sources at the cost of life. Outside the combo, Kiri is an expensive Man-o'-War effect that can replay our ETBs or bounce problematic creatures. The mana and slot efficiency makes Kiri lines quite attractive over Kiki-Jiki or Hoverguard Sweeper lines. The high-level explanation of this combo (which costs RUUU) is that we will use Imperial Recruiter to find Phyrexian Metamorph , which copies the Recruiter to find Kiri. We then bounce the Metamorph with Kiri. Metamorph comes back down to copy Kiri, which bounces the original Kiri. Casting Kiri again trigger's Metamorph-Kiri's "when you cast a Spirit" trigger and returns the Metamorph to our hand and bounces itself. This cycling of Meta and Kiri we'll call a "Kiri-copy" -- it lets us copy anything (generating an ETB) and return to having Metamorph and Kiri in our hand (ready to make another copy) at the cost of UUPP (where P is a Phyrexian Blue mana). We use this to copy Imperial Recruiter for Peregrine Drake , which nets mana (or pays for itself) if we have 4+ blue-producing lands. This yields infinite Animar counters and we can Kiri-copy our Recruiter to find Ballista to end the game. Now we can start formalizing the sequences we're discussing. P in the cost denotes that we paid 2 life instead of mana. Cost: UUPP at 3 counters. Nets: A copy of the copy target, 4 Animar counters. This is an expanded loop that uses Wood Elves to increase the land count mid-line. This is an early loop that uses Wood Elves to increase the land count by 2 mid-line. For this line you need to be able to produce an additional UU on top of the RUUU you need for the other Kiri lines. This will be denoted by a [+ UU] in the mana pool. In general, we'd like to prioritize using noncreature mana to play Animar, so we can use the dorks to generate counters and snowball our turn 3 more easily. However, hands that have the option of either sacrifice-mana or dorks need to think through which leaves you in a better position on turn 3, as a sacrificed Petal leaves you with less mana sources to work with than a Llanowar Elves. 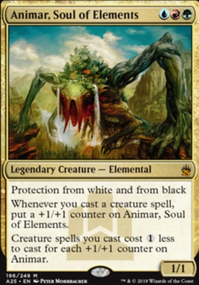 Rishkar, Peema Renegade is worth analysis here: he makes Animar tap as he comes down, can make bodies that came down earlier tap for mana in a way that nets mana, and can put counters directly on Animar to ramp quickly. Mana Crypt is a card that's notoriously been excluded from Animar, but (in this estimation) warrants reinclusion. It helps cast Weird Harvest, helps replay Animar if disrupted, plays large dorks turn 1 for increased turn 2 Animar density, and helps bridge the early creature casts before Animar has stacked counters. Generous Patron is an amazing add! Options between drawing and putting counters on Animar, makes creatures that can deny Tymna draws, 1/4 elf body. Loyal Drake draws the turn you play it and draws every turn after. Compares favorably to Elvish Visionary when discounted. Runic Armasaur is a strongboye and keeps your hand stocked. Deceptively powerful. Consecrated Sphinx is incredibly powerful, especially when played for UU. It's a strong option to dig you out of the worst of board states. It's important to have a creature option to generate massive value. Slithermuse is a slick way to dump and refill. Tishana is a powerful contingency plan we can grab if we've started to peter out. Drawing 5+ for UG is solid yield for cost. She can draw into clones and similar to keep the draws flowing in. Spellseeker and Imperial Recruiter are our tutor-chain all-stars. Many of our tutors will look to grab these when we're ready to win. Spellseeker is a strong toolbox card outside of its Harvest applications, getting counters, other tutors, Crop Rotation, etc. Imperial Recruiter is very flexible as well, and doesn't always need to be used directly to win. Weird Harvest has been been mentioned as a tutor that can grab multiple pieces. Survival of the Fittest finds Ancestral Statue ; use it to grow Animar, then pitch the Statue to find Walking Ballista. Worldly Tutor and Sylvan Tutor are low-cost high-utility tutors that pair well with Glimpse/Visionary effects. Eldritch Evolution and Chord of Calling put the target directly on the board and are particularly good for sneaking in Gaea's Herald or Spellskite. Fauna Shaman is a solid toolbox engine. Mystical Tutor finds Weird Harvest, Glimpse, creature tutors, counters, or removal. Prowling Serpopard and Gaea's Herald provide use with protection from countermagic. Utilizing these give us a strong anti-control option in the contemporary metagame that has a heavy amount of stack interaction. They become more affordable with Animar discount and also push us ahead in acceleration via counters. Spellskite , Siren Stormtamer , and Sylvan Safekeeper do the same to protect us from removal. We encourage our opponents to point their control spells elsewhere, which not only takes pressure of us, but directly funnels answers in our opponents' direction. We play a light countermagic suite as well, both to force our important Sorceries through, as well as shut down win attempts that would slip through the cracks. We're largely expecting our opponents to interact with others' win attempts, so ensuring they win the stack war with narrower counters like Dispel is likely sufficient. We play a number of utility creatures that can give us effective toolbox options to swing games in our favor. Clones like Phyrexian Metamorph and Phantasmal Image can copy our ETBs or borrow enemy creatures; in slower games, they are useful to duplicate card advantage engines like Tymna to get us through the grind. Gilded Drake is an amazingly efficient creature that has inummerable possible purposes; keep it creative and impactful. Bane of Progress enables use to play for value on a staxed out board and explode into a game-ending combo. It also slows heavily ramped artifact/enchantment boards, and comes down turn 3/4 fairly reliably while allowing us to ramp alongside it. Ancient Animus allows us to answer problematic creatures while also ramping Animar. Eternal Witness is a recursion creature that can serve as a backup win condition (by multi-casting removal and making infinite Swan Song swans) once we have infinite draw. Many other creatures can be teched in for the needs of your metagame. Big contenders might include: Goblin Cratermaker , Reclamation Sage , Man-o'-War , Profaner of the Dead , Manglehorn , etc. A special thank you to bunbunfriedrice, JMCraig, infiniteimoc, AstralCodex, Nakhla, and the Animar Discord at large. Join us so we can evolve together! A beetle on your shoulder!